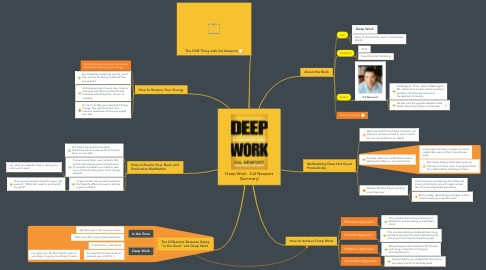 In this mind map summary of the book “Deep Work” by Cal Newport, you’ll learn how to achieve deep work, how to rewire your brain with productive meditation, and how to restore your energy. 1.3.1.1. Cal Newport, Ph.D., lives in Washington, DC, where he is a writer and an assistant professor of computer science at Georgetown University. 1.3.1.2. He also runs the popular website Study Hacks: Decoding Patterns of Success. 3. Multitasking Does Not Equal Productivity. 6.3.1. Once you've landed a specific target, ask yourself: "What do I need to accomplish my goal?"